Since May is also National Bike Month, San Diegan’s have opportunities to GO by BIKE all month long. Bike Month 2018 supports biking as an everyday, environmentally friendly, cost-saving commute choice. 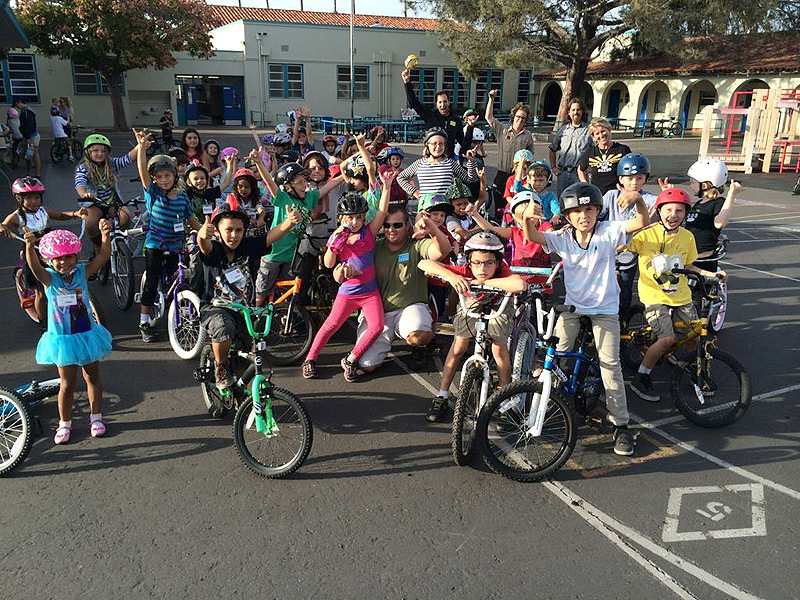 National Bike to School Day provides an opportunity for schools across the country to join together to celebrate and to build off of the energy of National Bike Month. Almost 1,000 local events in 49 states and the District of Columbia joined together to encourage children to safely bicycle or walk to school. Around the world, communities are committing to eliminating traffic fatalities and serious injuries, with an approach called Vision Zero. A growing group of these cities is focused on improving safety in school zones and other places where children and youth walk and bicycle. Vision Zero for Youth recognizes that starting with youth can be the catalyst to build community support for Vision Zero, and that Vision Zero should include a focus on youth. Bike to Work Day is a nationally recognized event celebrated annually in May. Bike to Work Day will be celebrated on a Thursday again this year. Register for Bike to Work Day and join thousands of commuters throughout the San Diego region as we GO by BIKE on the morning of Thursday, May 17, 2018. When you register for Bike to Work Day, you can pick up a free t-shirt* at one of 100 pit stops throughout San Diego County from 6 to 9 a.m. Register by April 15, 2018 to be automatically entered to win a $500 gift card from Revolution Bike Shop! *Participants must show proof of registration to claim their free t-shirt. iCommute will designate 100 pit stops by April 6, 2018. Pit stops will be open from 6 to 9 a.m. on Bike to Work Day to offer fun breaks for bike riders to rest and pick up a free t-shirt, snacks, and encouragement. *Check back in mid-April for a map of all 2018 pit stop locations. 7:00 AM - 6:00 PM ~ Races held all day. Join in the thrill of fast-paced bicycle racing by pro racers, top-level amateurs, a community walk, and a fun children's cycling event at the Barrio Logan Grand Prix, one of Southern California's largest cycling events. The race is open to men and women of all ages, from professional and Olympic Level Cyclists to first-time racers. Logan Heights Family Health Center Expo is returning to the event this year with free immunization for children and free pregnancy testing. They will also offer complimentary health screenings for families and young children to check their cholesterol, blood pressure, vision, teeth and more. New to this year’s event is a community walk that will follow the health expo. Guests of all ages are welcome to participate in the two-lap walk along the course. 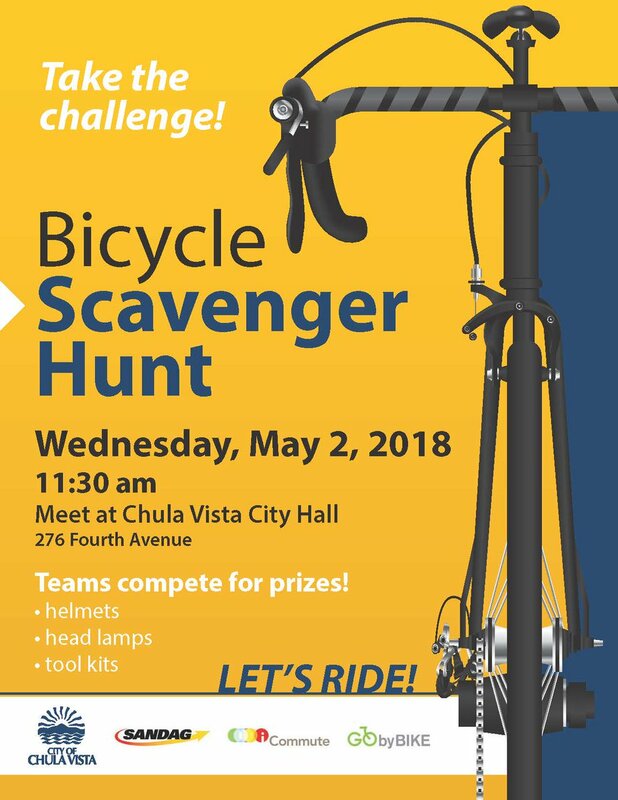 There will also be a free Kids Zone for youth participants offering free helmets and an opportunity to participate in a bicycle safety rodeo, sponsored by Mission Federal Credit Union. The Kids Zone will take place at Cesar Chavez Park on the Port of San Diego District Tidelands from 9 a.m. to noon. What: "Hippy Crit" - Four of the most scenic climbs on Soledad. Tickets are $15 and includes a beverage at Coffee Cycle, a Rouleur Brewing beverage at Iron Pig Alehouse, commemorative pin and at least three hi-fives..
Ride meets at Coffee Cycle 9:30 - 10:00 AM. Leaves at 10:00 AM on the designated route. Route subject to change. Cyclists arrive at Iron Pig between 11:00 - 11:30 am. Bike Garage will be set up with parking and a tent, as well as offering some basic mechanic services. Riders must be 21+, wear a helmet and waiver required. This ride includes dramatic elevation change. Cycling experiences, attire and equipment is recommended. 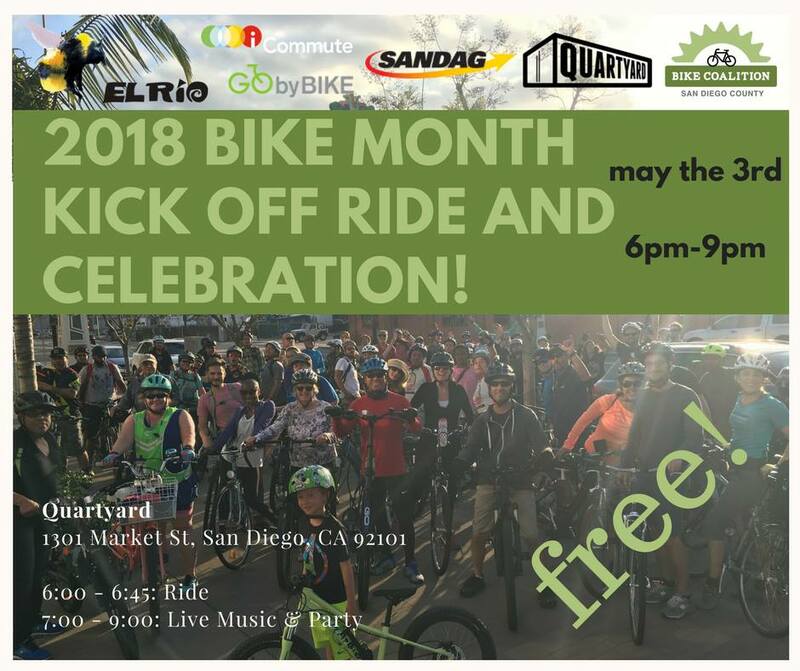 Take part in #GObyBIKEsd Mini-Grant recipient @sdbikecoalition's Bike Month kick off ride and celebration this Thursday, May 3! All ages are invited to join in for a community bike ride, live music, food, and giveaways. Reminder: Be sure to register for Bike to Work Day and join thousands of commuters throughout the San Diego region as we GO by BIKE. When you register for Bike to Work Day, you can pick up a free t-shirt* at one of 100 pit stops throughout San Diego County from 6 to 9 a.m.
*Participants must show proof of registration to claim their free t-shirt! A total of 100 Bike to Work Day pit stops are planned across San Diego County, which will be open from 6 to 9 a.m. on Thursday, May 17, 2018 for anyone who registers. Pit stops offer fun breaks for bike riders to rest and pick up a free t-shirt, snacks, and encouragement. For a list of the Bike to Work 2018 pit stop locations, check out the PIT STOP MAP. Are the T-shirts really that color this year? I have 3 or 4 that color already. They had a contest to choose the shirt's logo design. Both shirts were gray. About the Event: Looking for some new places to ride with some camaraderie on the way? Join for a fun 8 – 10 mile group ride along the San Diego River Trail. The ride will include informational stops about the future of the River Trail and bike connections. Please meet at 8:30 a.m., to roll out on time by 9 a.m. Participants must bring your own bike and safety gear. Please bring at least 32 oz. of water and sun protection. Bike Party/Bike & Brunch: Picnic in the Park! Our amazing friends from San Diego Bike and Brunch & San Diego Bike Party are joining forces this Sunday! This is gonna be a good one folks! What’s better than a bike ride with friends? How about two bike rides in one! May is National Bike Month, and we can’t get enough of all the celebrations already set for San Diego. That’s why San Diego Bike Party and San Diego Bike and Brunch are hosting a ride TOGETHER! Join both groups for a party-paced pedal through San Diego neighborhoods ending with a leisurely picnic in Golden Hill Park. Our regular Bike Party night ride is a lazy Sunday ride this month. Riders are encouraged to bring their own grub, but there are several places to grab snacks nearby. We’ll have a few outdoorsy games to share, but feel free to bring your Frisbees, bubbles, whatever makes you smile. Even if you don’t bring a friend, we’re pretty sure you’ll leave knowing a few. One thing you shouldn’t forget to bring on this ride IS WATER. And probably some sunscreen too. • Stop at red lights. • Pick up your trash. • Have a great time! As always, check your tires, brakes, chain, etc. BEFORE THE RIDE and get them some TLC from a Local Bike Shop if they need it. Even just an extra tube can save the day sometimes. We’re excited for this chance to have double the fun as two great bike groups roll together. Invite your friends! It’s a bikey, brunchy, party mashup. Come celebrate Bike Month with us! 1. Don’t forget to have your bike checked over before the ride, especially if you haven’t ridden in a while. Don’t wait until the last minute to make sure you have a safe ride - your day will be more enjoyable without the worry of your bike malfunctioning. There are a lot of great local bike shops who can help you out. 2. For a special discount on a tune-up before the ride, Thomas Bike Shop in South Park is offering a deal on a tune-up, so this Wednesday through Saturday (05/16 - 05/19, 10am until 6pm), if you head down to the shop located on 1635 Fern St and show the shop manager, Pac, that you have clicked “Interested” or “Going” to this event and he will offer you a tune-up for a discounted rate of 25% off service/labor to make sure your ride goes smoothly. 4. If you are plan to inbibe in libations, bring cans of things and cups and such other ways to avoid bringing in glass containers, as glass is prohibited in the park. 5. Think of other things you would like to bring for fun times at the park. Frisbee! Music and/or instruments! Bubbles! Lawn games! Kites! Balls to throw and kick! While we will hopefully have some picnic table access, it is not yet a guarantee, so bring blankets or other items to sit on. Send a message if you are looking to help with providing and/or transporting and I can help organize a bit ahead of time. 7. Last, but not least - bring water, sunscreen, and friends! Remember, we have a few bike-sharing options in town for those who might need a rental, and this ride is a very social-paced ride, so the one or two hills we will encounter will be manageable, and if you are at all unsure you can tackle them, know that we will happily wait for everyone to regroup before riding on. If you have any questions at all, please don’t hesitate to send a message on the FB pages San Diego Bike Party or San Diego Bike and Brunch, or send a DM to Jamie Rogers or Carrie Stemrich, the ride's co-organizers. WHEN: Saturday, June 16, 2018 at 8 a.m. Runners and bikers enjoy an 8-mile beach race between Imperial Beach and Coronado’s North Beach. Sponsored by the Coronado Rotary Club and US Navy, this annual event is fun for the entire family. Proceeds from this event go to programs which benefit wounded VETS and other worthy causes. Have fun and support our military! 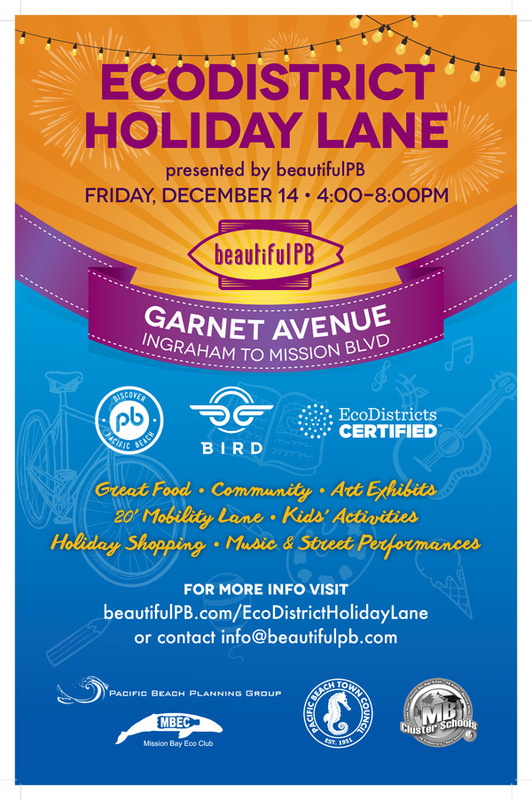 SANDAG invites you to stop by to talk with the project team and provide feedback on the proposed Park Boulevard Bikeway. 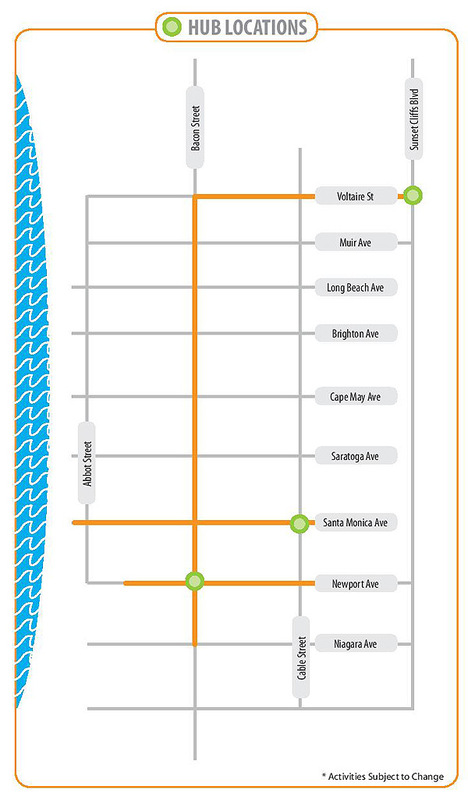 The Park Boulevard Bikeway project is one of five segments planned as part of the Uptown Bikeways, which will enhance neighborhood connectivity between Uptown, Old Town, Mission Valley, Downtown San Diego, North Park, and Balboa Park. The Park Boulevard Bikeway will provide a vital connection for people to walk and bike between Hillcrest, North Park, and Balboa Park. The Park Boulevard Bikeway will be completed in two segments. The first segment runs along Park Boulevard from Robinson Avenue to Upas Street, and the second along Park Boulevard from Upas Street to Village Place. The proposed bikeway will also provide important connections to several regional bikeways including the Eastern Hillcrest Bikeway to the west and the Robinson Bikeway to the east. I Love A Clean San Diego is looking for 8,000 volunteers to participate at more than 100 sites across San Diego County on Saturday, Sept. 15, from 9 a.m. to noon, as part of the 34th annual Coastal Cleanup Day. 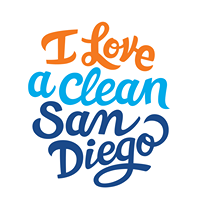 I Love A Clean San Diego has coordinated this event locally for 33 years and successfully mobilizes thousands of volunteers, while also supporting cleanup efforts in Tijuana. Volunteers of all ages and ability levels are encouraged to sign up for a site in their neighborhood and help leave a lasting impact on the entire region. For more information about sites and volunteer registration, visit CleanupDay.org. Last year, Coastal Cleanup Day volunteers removed 137,299 pounds of trash and recyclables from San Diego and Tijuana regions that otherwise would have polluted the beloved coastline and the Pacific Ocean. Each volunteer who brings a reusable water bottle, work gloves, and/or a bucket to collect litter significantly reduces the need for single-use bags and disposable gloves. Ride your bike to your local site and/or use your bikes with trailers to help haul heavy filled trash bags to collection points. Choose to clean bike paths like Rose Creek Bike Path, PB Pathways or the OB Bikeway along the San Diego River. Not only are you keeping trash out of the waterways, but you’re helping to improve the bike/walk commute for our fellow travelers! Thank-you. 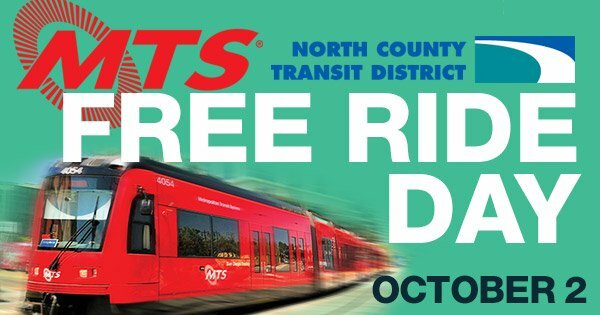 On Tuesday, October 2, 2018, San Diego County residents, workers and visitors can ride MTS and NCTD fixed-route buses, Trolley, SPRINTER and the COASTER for FREE. Yep, totally free. Change up your commute and Choose Transit. Whether you’re looking to leave the bumper-to-bumper behind, or want to make a tangible impact on our environment, Free Ride Day is the perfect time to change the way you move. No fare required, just hop on board. RSVP on Facebook, or at sdmts.com/free-ride-day to get event reminders, trip planning info and more. This is a great opportunity to discover the convenience and utility of multimodal commuting. Use your bike to get to stations/stops – ride the transit – then use your bike to get to your destination. First mile/Last mile by bike or walking and let transit do the long haul. Easy peasy! 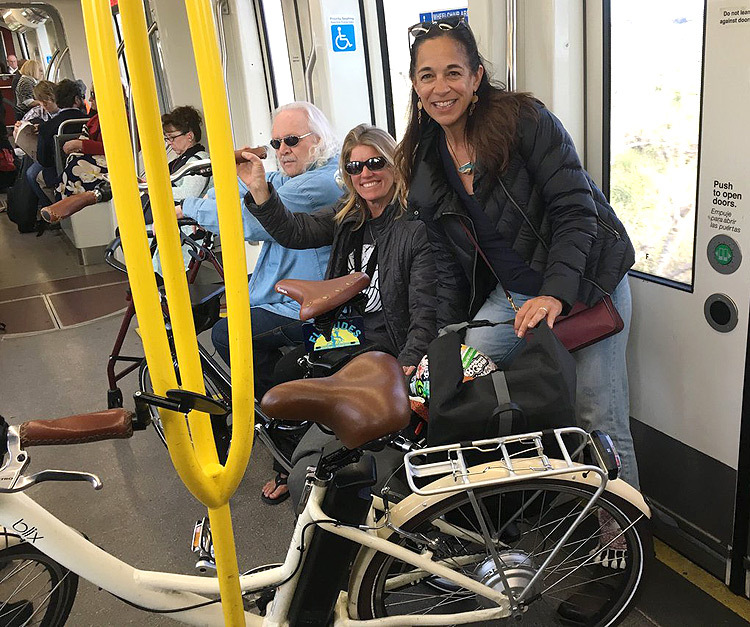 From the beaches to La Mesa for meetings; multimodal commute saves time, avoids traffic, parking hassles and is fun to boot. Access more information on the transit links above to plan/time your route and learn how to ride with bikes on board. You may find a new, easy way to commute by transit/biking to get all around the region for work, play and fun! 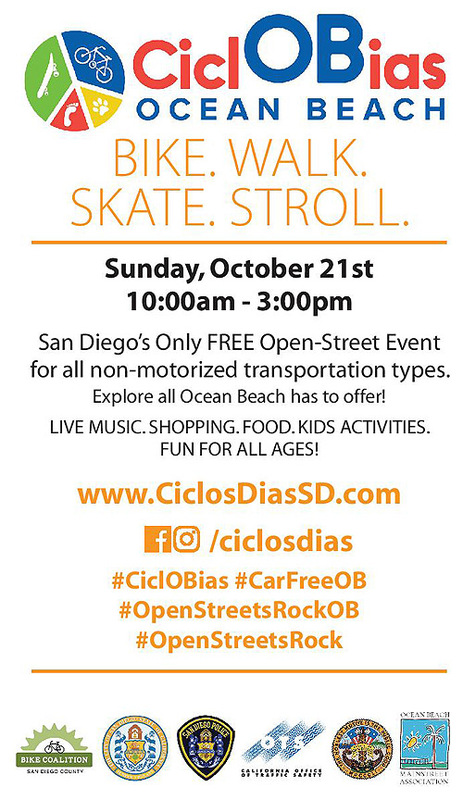 Please join us for San Diego County Bicycle Coalition’s CiclOBias open street event. It will be a “car-free” event and cover about 2-1/2 miles on Ocean Beach streets between and around Voltaire St. and Newport Ave. It will be open from 10am to 3pm and available for any non-motorized vehicles; bikes, skates, scooters, strollers, and pedestrians. The coalition has done similar events in PB, North Park, Barrio Logan, and downtown, and booths will be available for local businesses only. Please contact Skii at skii@sdbikecoalition.org of you are interested in volunteering. Ride the Hidden, Unridden, and Forbidden Point Loma in San Diego, CA. on EXCLUSIVE routes open once a year! See San Diego like you’ve never seen it before and the Bragging Rights that go with it! Ride the Point was inspired by the late Jim Krause an avid bicyclist, Rotarian, and family man. Like all of us who ride, he loved getting out there with other cyclist for a day of riding, fun and comradery. He lived life to the fullest and dedicated himself to the cause of finding a cure for pancreatic cancer. We missed riding with Jim and decided in 2013 to organize Ride the Point – a ride dedicated to Jim and his passion for life. Looking for that special bike part, bicycle, wheelset, clothing, or accessory? Twice a year the SDVA hosts an everything bicycle swapmeet in the infield of our track. Gates open at 7:00 AM for our sellers and at 9:00AM for our buyers. Route: Will loop from and back to the park. Route to be posted before the ride begins. This is the 10th Annual San Diego Tweed Ride. Ten years means its time to make the event better than years past! Will meet up outside Panama 66 Restaurant. Park outside the San Diego Museum of Art in Balboa Park at 10:00 am. Ride to leave by 11:00 am. We will take a group photo prior to leaving. This Ride is FREE as always. A slow pace and relatively flat route is kept to accommodate all types of bikes and riders. This ride is family friendly. After Party: This year, we will be celebrating at Panama 66 afterward in the Sculpture Garden. Bring your blankets, line up your bikes in the fenced in area (Please bring a lock) and enjoy some live music, dancing and take a photo in our booth. We will have a raffle going with great prizes from some sponsors. Updates will occur as we get closer to the ride date. During the Prohibition Era, the San Diego Gaslamp neighborhood was filled with gamblers, bootleggers, thieves, and was home to the red light district. The Yuma building was the first of many brothels to get raided in the initial clean up of the city in 1912. Nestled among old Victorians, this hat shop showcases the original catwalk that shopkeepers of old used to observe and manage their workers. Our shop also features custom furniture designed and created by our artists, a large scale mural installation, and hats galore. This Vendor might be a good candidate for the SDBikeCommuter Discount Program. Garnet Avenue in Pacific Beach will be a vehicle-free street with a 20' Mobility Lane for bikes, skateboards, skates and scooters. Restaurants and retail shops will activate the street for shopping and lounging. There will be festive local music and street entertainment for all ages. 10th Annual Tweed Ride - tomorrow, Sunday 12/2 at 10am. Panama 66, Balboa Park. Let's ride for Roberta! Join friends, fans and fellow community members on Saturday morning to take part in one of Roberta's favorite activities-riding the coast on two wheels. This ride is about peacefully demonstrating a rider's right to safety on the road, as Roberta did everyday on her morning rides to Beacon's, to work in Cardiff or to speak at City Hall passionately in support of safer roads for all, inclusive for every age and ability. Glam it up the way she would! Bring posters of support for her quick recovery, get your bike dressed up for the occasion too! What is the message you would like to convey on her behalf? Say it loud and say it proud! We will not stand for one more preventable deadly or life-altering tragedy on our local main street and demand better infrastructure now. "Roberta is incredibly kind, passionate, and active. She starts her days by either surfing at Beacon's, her local break, or cycling up the coast. She loves her community and does everything possible to support it and make it a safer, more accessible place for everyone. She stands up for what she believes in and is fearless in doing so. She's is one of the hardest workers out there! Her presence fills rooms and her laugh brightens up any situation. To those who are lucky enough to call her a friend, she will be there for them no matter what. For those who don't know her, she is welcoming and quick to want to know you. "